If your Irish ancestry research has already led you to the county of Ireland where your family lived, you may still need to search for clues in your immigrant ancestor's adopted country. Be sure to exhaust all the techniques suggested on the Hunt for the townland, Part I page. Or you could start to turn your attention to sources in Ireland. 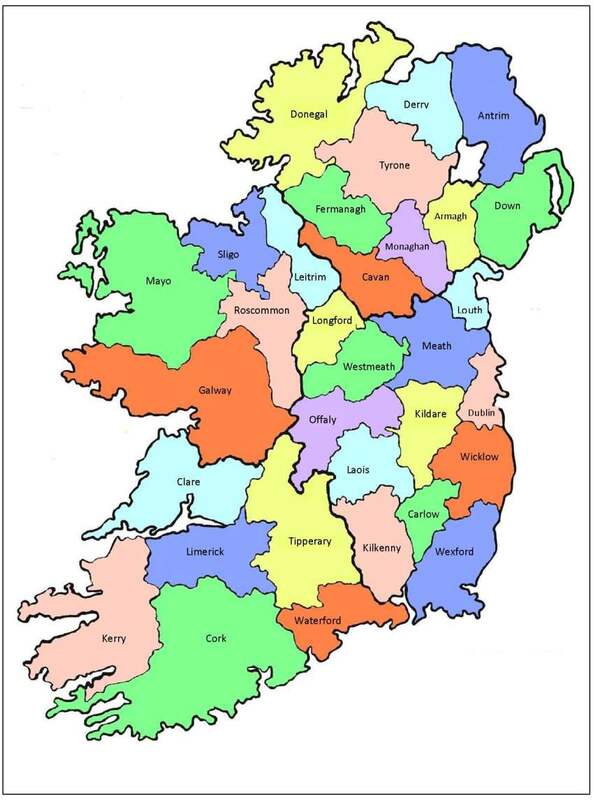 Irish ancestry research: Become familiar with the counties. Genealogy records in Ireland can, sometimes, be successfully searched on a county basis if you have an unusual surname or if you have already collected additional information (particularly about other family members) . There's no hard and fast rule about this. It just depends on what you know and how well what you know matches with available records. In other words, it might be a good move for one genealogist while another would better spend their time (and possible save money) by continuing to search in the migrant's adopted country for that all-important townland of origin. Either way, once you know the county where your ancestors lived, you might want to join a county-based Irish family tree research society or historical group. If you're not quite ready for that, you can start finding out about 'your' county through books or websites. Familiarising yourself with its history and especially its geography will come in very useful as you progress your research. If you are sure of the county where your Irish ancestry originated you should still focus on finding their townland because without it you won't be able to use some of the most detailed resources such as church records. If you know the county where your ancestors lived, you might want to join a county-based family or local history society. Ireland's Heritage Centres have indexed records which can be searched for a fee. (Only occassionally will you be allowed to do this yourself. The search is usually carried out by one of the centre's team. Phone in advance to clarify.) They can be extremely useful, and well worth the cost, for lifting your Irish ancestry search over initial obstacles. They cannot perform miracles, though. 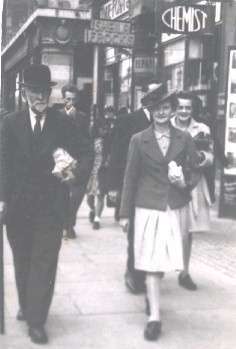 Patrick Doyle, born Wexford 1863, strolling down O'Connell Street, Dublin, with my Nana in 1947. In 2008 an online database of Ireland's placenames was launched at www.logainm.ie. Created by the Department of Community, Rural and Gaeltacht Affairs, this database could be of use in your Irish ancestry search. The site is searchable under both Irish and English versions of a placename and includes information notes about many of the locations. Sound recordings have also been added for the placenames of selected locations in counties Donegal, Galway and Waterford, and some original source materials can also be viewed. Mapping tools will be added in the second phase (2009-2010) of the site's development. In your search for your Irish ancestry origins, or even to top-up information you may already have about that place, this website may well become one of the most useful Irish genealogy databases. Unless your ancestor had a particularly unusual name, you are not going to have much luck if all you know is a name and a rough idea of when he or she was born. However, if you know the name, even a common one, plus an approximiate date of birth and a few details about the family, it may be worth paying for a search. I did this when searching for my great grandfather Patrick Doyle. I knew he was born in 1862-4 in Wexford, that he had a brother John about three years his junior and that their father, another Patrick, was a blacksmith. I also suspected, on the basis of Irish naming patterns, that my great grandfather's mother was called Anne. This turned out to be correct but I'd have been foolish to have relied on it before I had documentary evidence. Through Wexford Heritage Centre, I discovered the names of my gt grandfather's parents and siblings and their original townland. These details have led me to new branches of the family which I'm still researching. So, if you have some pertinent facts about your ancestral family and you are sure of the county, the local heritage centre may be able to provide clues to your Irish ancestry. Make sure to ask for an assessment of cost before you commission the study. Most centres (in both Northern Ireland and the Republic) are members of the Irish Family History Foundation (IFHF). You can find their addresses here. If you don't know either the county or the townland where your family lived, see Irish ancestry: The hunt for the townland, Part I. When you know the name of the townland, you can really start to make headway with your Irish family history project. 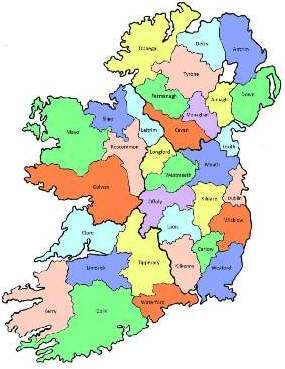 Once you've established the name of the townland, check out my top five websites for learning more about places..
Get to know 'your' county: see Antrim to Down; Fermanagh to Louth; Mayo to Sligo and Tipperary to Wicklow. Understand the basic Irish land divisions. Find out more about Griffiths Valuation and other land and property records. By Claire Santry, Copyright© 2008-2018 Irish-Genealogy-Toolkit.com. Dedicated to helping YOU discover your Irish Heritage.